Today, academic, public, research and special library professionals are searching for new ways to optimize space utilization and improve library ergonomics. Franklin Mills is leading this movement with a full range of library shelving solutions including display stands for periodicals and other similar items. Our tilt-up periodical display shelving incorporates a sloped shelf that is hinged to lift and stay open for easy retrieval of magazines stored beneath. The sloped display allows for easy browsing while back issues are conveniently stored under the sloped shelves. Library staff will appreciate the effectiveness of our display cabinets especially when multiple copies of magazines circulate throughout the library. Our children’s periodical shelving is specifically designed to accommodate kids. 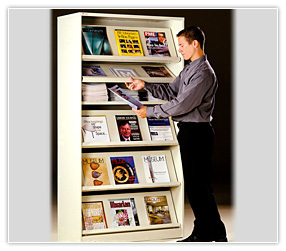 Our periodical displays are designed with safety in mind - allowing safe and easy access to magazines and information. Our display bins make retrieval easy without having to lift standard "tilt style" shelves ensuring small hands and fingers are kept safe from moving parts!